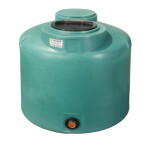 Premier Plastics Inc. manufactures CSA / NSF certified polyethylene water and septic tanks in a wide range of styles and sizes for you to choose from. To help you find what plastic tank suits your needs, we have outlined some basic points to consider when making a decision. If there is something you are not sure about, ask a Premier Plastics Expert. Will the tank be placed above ground or be buried? Tanks for burial are ribbed or shaped to resist the pressure from the ground around it. 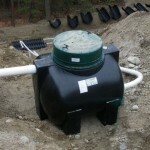 Underground tanks are rated by the maximum depth of earth cover allowed over the top. Lightweight fill such as styrofoam boards of bark mulch could be used if the required depth is over the maximum (consult our factory). The level of ground water, frost line, depth of bedrock, and backhoe access are also considerations when installing tanks underground. 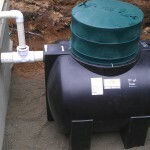 Above ground tanks are designed to withstand the pressure from the water sitting inside the tank. Poly tanks must always be vented to atmosphere. Usage needs per day or month for household, gardening, car washing etc. Source of water and reliability of supply i.e. from rainwater, creek, well, water district or truck. The longer the period with no or reduced supply, the larger the tank must be to serve your needs during these times. The best location and space available for your tank. Also, how will you get the tank into place? 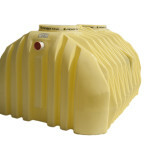 Polyethylene tanks are bulky but are relatively light weight. 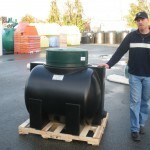 As a very rough guide, for the purpose of handling, polyethylene tanks weigh approx. 0.2 lbs. per gallon depending on size. Do you have vehicular or marine access, steep slopes, planted areas, trees, pathways or outbuildings to consider? Your BUDGET. Can you plan on leave room for future expansion? The size of your home if you need a septic tank. Septic tanks in British Columbia are sized primarily by the number of bedrooms. Sizing in other jurisdictions may be by the number of bathrooms or number of people. A State or Provincially registered sanitarian, registered on- site wastewater professional or your local environmental health authority should be consulted when planning onsite sewage systems. These tanks are vertical cylindrical in profile and are also the most commonly installed in the market place. Generally, these are the most economical in terms of dollars per gallon. These tanks are for spaces with limited headroom such as crawlspaces and under decks. The low profile also allows moving into place through narrow openings. In tight spaces a floor panel could be installed above access lids. The tanks are designed to lay flat and not be placed on their side unless properly braced against bulging. Consult the factory if this is your only option. Used for applications that require completely open top access, such as fish rearing or chemical mixing. The tapered side allows multiple tanks to nest together for shipping economy. A specialized tank for very narrow vertical spaces (18” or 22” wide) or when clearance in front of the tank is limited. The ‘holes’ in the design prevent the sides from bulging when filled. 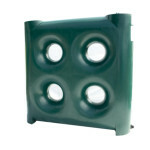 A slim, low profile tank for low headroom or narrow spaces –inside or outside space. Will pass through a 36”’ wide doorway. Uses include storage and re-pressurization of water supply from low yielding wells to regain flow rate during periods of peak demand during the day, rain water harvesting, and for standby storage to suppress small fires. Designed for sediment collection or granular material. The tanks require a steel/fiberglass floor stand for support. 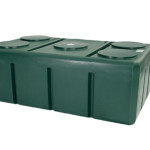 Leg tanks can provide the maximum storage volume in a rectangular low headroom space. They are also a convenient way to transport water by pickup truck or trailer from a public utility. Uses include spraying, pressure washing or portable fire suppression. The smaller sizes can be positioned crossways in a truck box to leave room for other equipment or supplies. Keep in mind the weight of the water you are transporting and the hazardous effect of water moving around a partially filled tank. 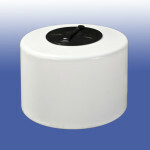 Utility tanks are vertical cylindrical in profile and are specifically designed for 30” or 36” door opening access. The larger sizes are used for standby fire suppression where there is no municipal supply. These are tanks installed below ground for water storage. There are a number of styles and sizes. These are SuperTanks, Saturna Tanks, Fat Albert Tanks, Submarine and Moonlander styles. Check the maximum bury depth for each size. 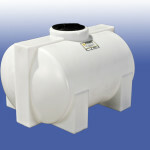 These tanks are designed for partial or below ground installation. Styles according to size are SuperTanks and Saturna Tanks. Styles of septic pump out tanks and trash tanks are SuperTanks, Saturna Tanks, Fat Albert Tanks, Submarine Tanks and Moonlander Tanks. 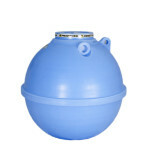 Gravity powered septic ‘FLOUT’ dosing packages are installed in four sizes of heavy duty Leg Tanks. Check the maximum bury depth before making your selection. Colour is used for esthetic or identification purposes. Vertical water tanks are either black or dark green. Some sizes are available in either colour. When used outside these colours are less noticeable and limit sunlight penetration. The natural polyethylene we use has a built in ultra-violet light stabilizer against sunlight. Most, smaller tank sizes are natural white. Typically, underground water tanks (cisterns) are blue, septic tanks are yellow. All pigments used (except yellow) are CSA/NSF certified for drinking water. Self venting with smaller field: 0.46 min. Separate Air Vent larger fields > 1.12 min. Squirt height and residual head readings. Steady state trapped air in transport pipe > 1.42 min. System drainout > 0.23 min. Squirt height and residual head readings > 0.55 min. Shallow grade transport pipe. Trapped air limits residual head > 1.22 min. Vented transport pipe purges air to deliver higher residual head > 0.09 min. Flout Test Air Water Interaction May’2012 > 1.54 min. PREMIER PLASTICS ANNOUNCES 3 NEW EXCEL DESIGN/PERFORMANCE APPLICATIONS. – All Easy to Use, Very Fast and no Fees. 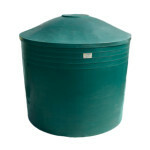 Storage Tank Size Optimization for Rain Water Harvesting Systems. Includes Monthly Weather Data. To have a Live Application sent to you, please fill out the form below. or contact us via email. “Hey John, nice picture of my site. That was a good job. It turned out very well”. “The Flout dosing system works great. The Installer was very impressed with how easy it was to install and the Owner was happy with the cost and no electricity. I will use this product every chance I get. “Just wanted to tell you I designed a system around the flout for the Affordable Housing Association here on Denman and it worked like a charm. Your worksheet worked well and the dose pressured up the field evenly for about 3 minutes. I called the person who will be living in the house, he went and saw the squirt test and was impressed with the whole idea of dosing with no electricity as he is the one who will be paying the bills! “Here are the pictures from the Prospect Road project. Thanks again for all your design help. As you know, I was skeptical as to the function and design of this new technology, but I was extremely impressed with how it turned out, and the incredible squirt height that it provided. I will be using this method of pressurizing a septic field on my next available sewage system design. “I had occasion a few days ago to require a very small plastic part that I had difficulty finding in various outlets in the Vancouver area. I received mostly disinterest at those centres which I visited because either they didn’t care or didn’t know. I would guess the former. “Attached is your document showing your numbers and my spreadsheet numbers – very close. Please watch our video above “Welcome to Premier Plastics”.